Because I have a very twisted mind, when I read the title "Baby Fringe", I was expecting to read about some radical baby group living on the outskirts of society. 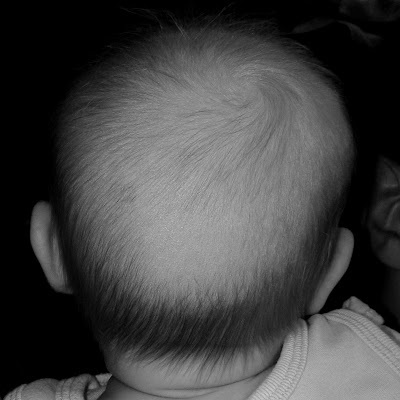 Pleasantly surprised to see such a cute head of fringey baby hair instead. Awww, so sweet. I love that fringe of hair at the back of the head. I run my fingers through Saffron's all day long. baby mullets are the cutest! V is just not growing some hair on top again. he had a mullet for a good long time. Eva had a mohawk... and everyone asked if i cut it that one on purpose. ha! currently, my little one also has the fringe. the bald spot really makes me feel guilty sometimes for the amount of time she spends laying down, but she loves it. and I love the term "baby fringe". much friendlier than mullet. What's so beautiful about that pic to me is what is not there. There is no scar on the crown chakra from an internal fetal scalp monitor.